I have a confession to make, I love trashy novels. Don't get me wrong, I also love classics and best sellers and non-fiction and moving pieces of written art...but I love trashy novels. To me they are like perfect romantic comedies without the bad acting. Now I'm not talking about Mills&Boon here, but cheap, fluffy chick lit. My mother has always referred to them as 'Teenage Mills&Boon' or 'Babysitter Club Trash', depending on my age. She never understood why novels without substance are sometimes exactly what I need. I love to read, I always have and I will read anything I get my hands on. One of mum's favourite 'quotes' on me was after my first day of school. I was desperate to go, she had taught me to start writing/reading while I was at pre-school and I could write the names of my family and spell cat, dog, mum, dad...you know, the basics. I was so excited about big school and learning to read and write properly I bounced into school that day. When mum picked me up that afternoon, she asked 'How was your first day at school?'. With an exasperated sigh (the type a 5 year old does well) I replied 'Well, I haven't learnt to read yet'. For my sake, I'm glad it didn't take me long after that. And since then, I've read and read and read. During primary school, I spent more time in the library then I did in the playground. Even my high school librarian knew me by name and let me know when new books came in. During university though, my taste in books definitely got trashier. At an age where relationships were a new(ish) thing and there was a lot of extra educational literature to get through (though I did do engineering, not law! ), books became my escape. Now I'm into everything again. I try to get a hold of books with rave reviews and classics that I know I will always read, but most of the time I end up with a trashy novel. When buying books, a major reason is that trashy novels are so cheap (as demonstrated by the $5 a book collection above) so it's easier to justify buying them. Most of the time, I go looking for a book when I'm bored and have an hour or so to kill. This means I need a book that I CAN put down, otherwise I won't get anything done. I also like to be able to finish a book and an afternoon and be left with a warm, fuzzy feeling rather than a deep contemplating one. 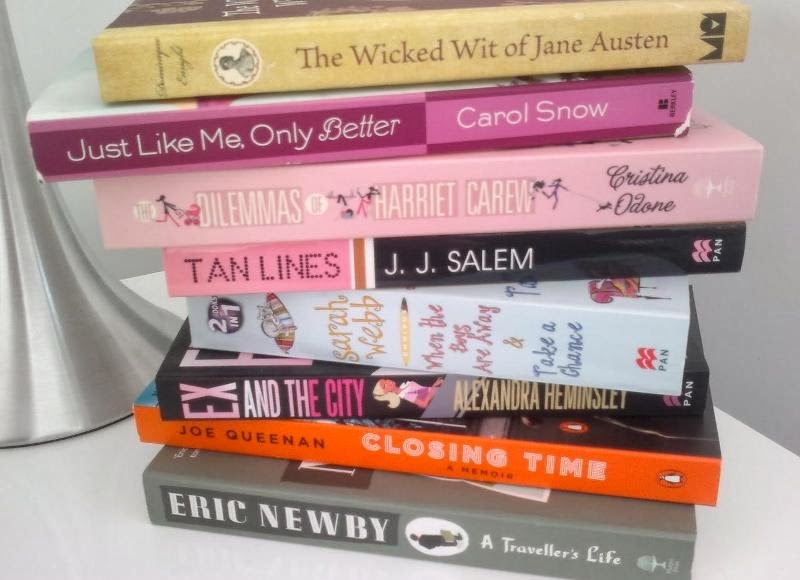 I have already finished 'Just Like Me, Only Better' by Carol Snow and I'm hoping to get through anoter one or two before I head home this weekend. MissT is also a bookworm with an even trashier taste than me (she <3's Gossip Girl etc.) and will appreciate a few new reads. I know what you mean! Trashy books are just so EASY to read. I've recently acquired more trashy novels than I know what to do with though! I helped a friend move house, and she was throwing them out for recycling, can you imagine?! Of course I rescued them, but am now drowning in a pile of trashy books every time I step into my bedroom!